'Raising the Rafters Folk Club' started in May 2013 to raise money for the Wath-upon-Dearne Parish Church roof appeal (hence the name!) – and it’s all gone on from there! We raised nearly £2000 to help rescue one of the finest Tudor roofs in England and have gone on to become what we believe is a unique Folk Club! - a Folk Club which exists to raise money for local and national charities. Our motto? - Everything we take, we donate! 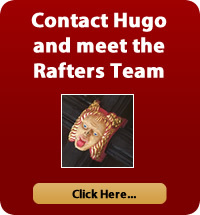 Meet Hugo - one of Wath Parish Church’s world famous roof bosses! He’s been up there since at least 1540 (24 years before Shakespeare was born!) and led a generally quiet life until being catapulted to stardom by the Raising the Rafters Folk Club who use him as their mascot. Since then his image has appeared all over the place.... such is fame! Raising the Rafters is a club that runs on one thing - generosity - and over the years we've built up a large band of supporters who all agree that Raising the Rafters is a friendly folk club and it doesn’t matter whether you want to bring an instrument and join in or just come and soak up the atmosphere and the music....you’ll be very welcome. The door prices are kept deliberately low at a flat rate of £5 per person and as there are no rip-off bar prices to pay, a Raising the Rafters evening is a good value night out! Young people 16 and under - admission free. And It’s All For Charity........! Everything we raise goes to charity! We have raised over FIFTEEN THOUSAND POUNDS for good causes since we started! Generally we leave it to the guest to choose which charity to support and we are the means of turning their musical talent into money for their chosen charity. Sometimes we ask our supporters. It's a unique model of a folk club..... got a charity you’d like us to support? Email Hugo and tell him!